The University of Oregon is gearing up for an epic Air Jordan giveaway. Taking to Twitter today, Oregon athletics&apos; official account GoDucks tweeted, "Jumpman jumpman jumpman. We&apos;ve got some J&apos;s to give away tomorrow night. 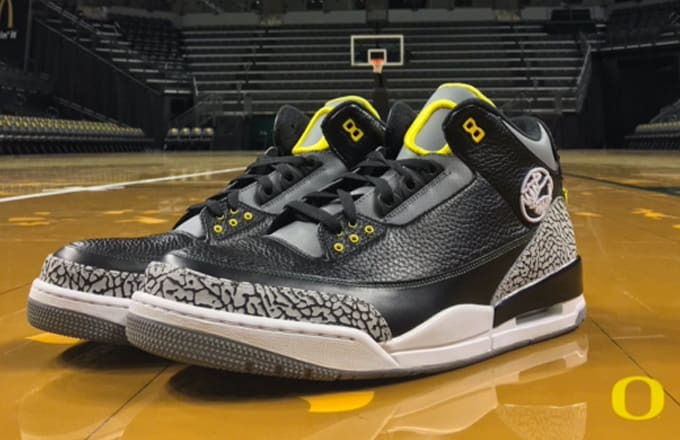 #GoDucks #DuckSwag #kotd" along with a photo of an Air Jordan box as well as the highly coveted Air Jordan III Retro "Pit Crew." It&apos;s not clear whether this contest is open to everyone or if it&apos;s limited to those in attendance of the Ducks&apos; game against the Washington Huskies tomorrow night. More details should emerge shortly so if you&apos;re interested in chance to score the "Pit Crews," we suggest you keep tabs on the GoDucks&apos; Twitter account.